During the 1986 mock television trial of Lee Harvey Oswald, the late former Los Angeles prosecutor, Vincent Bugliosi, question renowned pathologist Dr. Cyril Wecht about a “magic bullet” of his own creation – one that, by his own admission, was moving in a straight-line on a downward angle, passed through the president’s upper body and exited his throat, but then failed to hit the limousine or anyone in it - apparently vanishing into thin-air! “Did it broad jump over the car?” Bugliosi asks in a mocking tone. Such is the world of “magic” bullets that not only defy physical law but rational thought as well. In 2003, another magic bullet entered the lexicon of assassinationology – this one created out of whole cloth by journalist and author Max Holland. 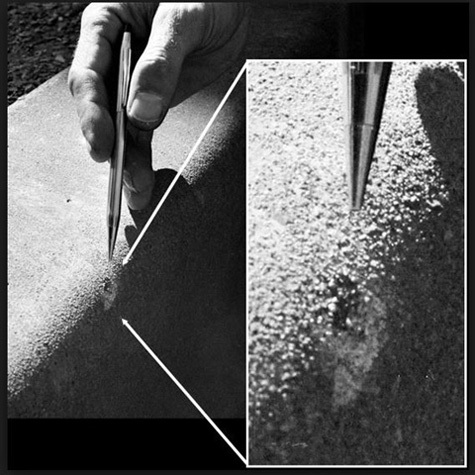 Holland’s latest version, published in the journal of the Association for Crime Scene Reconstruction, in May, 2016, postulates a wild bullet with truly magical properties. Holland recently wrote a response in Letters to the Editor of the AFTE Journal, the official publication of the Association of Firearm and Tool Mark Examiners (AFTE) (and published this month)  complaining about an article describing the forensic work of Lucien C. “Luke” Haag, elder half of the respected father-and-son forensic team of Luke and Michael Haag who have been debunking popular conspiracy theories surrounding the JFK assassination for the better part of two years using 3D laser scanners, Doppler radar, and other high-end forensic equipment. On November 11, 2016, Holland posted a critique adapted from his letter to the AFTE editor on the website, Washington Decoded, for which Holland serves as editor. Holland notes that his letter-to-the-editor appears in the AFTE Journal’s Fall 2016 issue, “along with a response from Haag,” but fails to include any portion or rebuttal of Haag’s lengthy response. Holland simply notes that the AFTE Journal, while online, is behind a paywall and leaves it to his readers to figure out how to get it. Nice. As a service to interested readers, here are Haag’s published remarks, along with some additional commentary from yours truly. “As will be shown,” Luke Haag writes in his response to Holland’s letter of complaint, “Mr. Holland, as a journalist and Mr. DeRonja as a metallurgist, haven’t the training or credentials to adequately and properly evaluate my reconstructive efforts in this historic shooting case. “[I am] at a loss to explain how being a journalist qualifies a person as an expert in shooting scene reconstruction. Likewise, knowledge regarding metals and alloys is of little to no help in measuring the dynamic, physical events in projectile ricochet from various surfaces. “I am a forensic scientist of some 50-plus years-experience and over 200 presentations before my peers, most of which have dealt with the reconstructive aspects of shootings. “To take the approach of The Lost Bullet, the 2011 DeRonja/Holland Report, the November 28, 2014 Newsweek article, and the May 2016 article in the Journal of Crime Scene Reconstruction would be the antithesis of The Scientific Method. “In these publications, Holland and DeRonja took a notion (at best, a hypothesis) and then went looking for something, anything to support it. Not finding any such physical evidence, or producing any reliable test results did not dissuade these writers from clinging to the most recent (final?) idea that Oswald’s first shot struck and ricocheted from the traffic signal mast arm (but left no evidence of it) and the lead core went on to – pick one – (a) strike a grassy area next to a manhole cover, or (b) strike the concrete curb, or (c) strike the grassy area, followed by the concrete curb, and then cause some sort of fragment to strike James Tague in the face. “I wanted to know,” Haag continued, “(1) what such ballistic damage would look like, (2) how obvious it would be to an investigator or arborist, (3) what sort of velocity loss striking one or more Southern Live Oak branches would induce in a 160 grain WCC Carcano bullet, (4) whether these bullets would fragment in any way as a consequence of striking multiple Southern Live Oak branches, and most of all, (5) what sort of deflection the bullets would experience. “Here’s the problem with the foregoing,” Haag responded. “Holland and DeRonja knew at the time that a strike to the traffic signal and/or its back plate would have been obvious and that these possibilities could be excluded. “Nonetheless, the audience watching NatGeo’s The Lost Bullet up to the bitter end are left with the clear and distinct impression that this is what happened! This is disingenuous, misleading and intellectually dishonest. “Just as the opening credits state, the NatGeo production was entertainment, not good forensic science. “But it gets worse. Figure 4 on page 35 of Holland’s November 28, 2014 Newsweek article, The Truth Was Out There (See: Fig.1) now shows the first shot striking the traffic light support mast, the separated lead core traveling straight line down Elm Street to a grassy area next to a manhole cover, ricocheting from this location, then continuing on, straight line to the concrete curb, then presumably somehow resulting in James Tague’s minor facial injury. “But they certainly did not report their findings to the NatGeo producer,” Haag rebuts, “And what would Holland and DeRonja know about reproducible results; they only managed to hit a traffic signal back plate once out of 3 attempts with inappropriate ammunition and provided no data on velocity loss or deflection angle and direction. “My fourth AFTE-JFK article only showed the first of three (3) steel poles employed for the deflection/velocity loss studies,” Haag writes. “The subsequent poles were standard, 2-inch diameter steel poles. 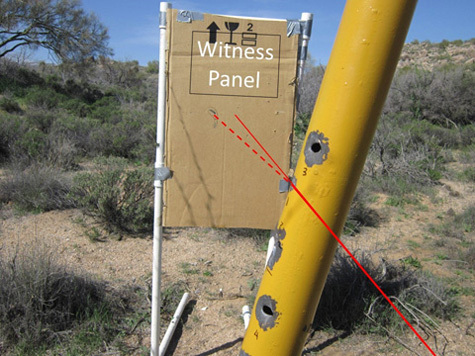 These 2-inch diameter steel poles were even more fragile and susceptible to ballistic damage from a 160-grain full-metal jacketed (FMJ) Carcano bullet than the pole depicted in Figures 14 through 17 in the Spring 2015 AFTE article. 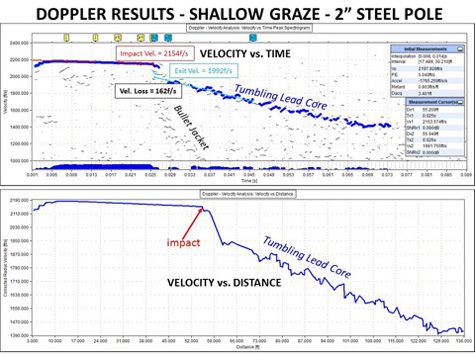 “Deflection and velocity loss values from grazing shots to the 2-inch steel poles were nonetheless quite similar to those presented in my fourth JFK article,” Haag explains. “All of these tests in which shallow, grazing strikes occurred resulted in relatively small deflection angles and high remaining velocities. Extrapolating these results to the geometry of the assassination scene (the 6th floor window and the traffic signal support mast) quickly reveals that the bullet with or without its copper jacket would have struck the asphalt of Elm Street and disintegrated. 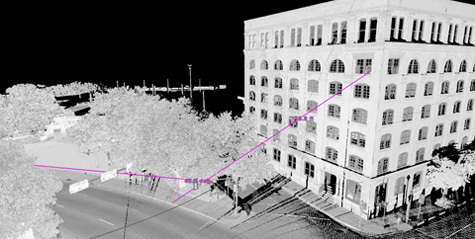 “The readers of this response should study the Leica 3D laser scan produced by Michael Haag and Tony Grissim. In order to satisfy the Holland/DeRonja ‘reconstruction’, the grazing strike to the support mast (which they have never found to this day) would have to achieve an angular change of approximately 40 degrees! “As physicist and wound ballistician Larry Sturdivan has previously pointed out, and I have repeatedly demonstrated, this would have to violate some very basic requirements of the Laws of Physics and terminal ballistics. “Attached are three (3) Leica 3D lasers scans prepared by Michael Haag (captioned MGH-1, MGH-2 and MGH-3) (See: Fig.7-9) which illustrate the most basic requirements* for a bullet or bullet core to be deflected from the traffic signal support mast and reach James Tague, or to reach a grassy area (“turf” to use Holland and DeRonja’s term) near a manhole cover. Holland made certain to mention to the AFTE editor that a “thorough discussion and analysis of a glancing bullet ricochet strike to the signal light mast arm can be found in a May 2016 article by DeRonja and Holland in the on-line, open-access journal of the Association for Crime Scene Reconstruction – suggesting that the membership-only availability of Haag’s work was somehow less accessible, and therefore, to be regarded with suspicion. “Until very recently,” Haag responded, “[the Association for Crime Scene Reconstruction (ACSR)] journal was unknown to [me]. Given that Holland and DeRonja have excluded a strike to the traffic signal and traffic signal back plate, and only postulate an extremely shallow graze to the mast arm, one has to wonder what sort of a peer review process was carried out on their submission, and most important, what were the credentials of the person or persons conducting such peer review. “So, AFTE readers who do have a reasonable, to good working knowledge of terminal ballistics and how to design a proper experiment, let’s have a look at this obscure publication and the Holland/DeRonja article. “It is true that it is rare, but it can be obtained if one knows where to look. This writer has managed to obtain approximately 200 rounds of this ammunition, most, but not all of which have now been consumed in the many experiments leading to my five AFTE articles. “Holland and DeRonja’s inability to locate the correct ammunition for their experiments may be the consequence of not being criminalists or forensic firearms examiners. “It gets more troubling when one reads on page 22 [of the ACSR article] that Holland and DeRonja used some unknown Italian ammunition with bullet weights of 145-grains (the WCC Carcano bullets weighed 160-grains) and some Serbian ammunition with 139-gr. Pointed, boat tail bullets (the WCC Carcano bullets were round nosed and much heavier). “Figure 15 on page 24 of their article shows a green pole a mere 4 or 5 feet away from the muzzle of the Carcano rifle,” Haag continues. 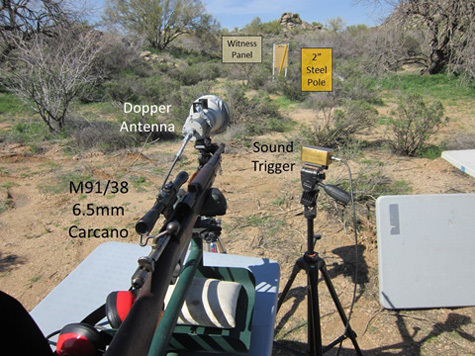 “Only four shots are described, and only one of these (Shot 3) produces a shallow graze to the target pole. 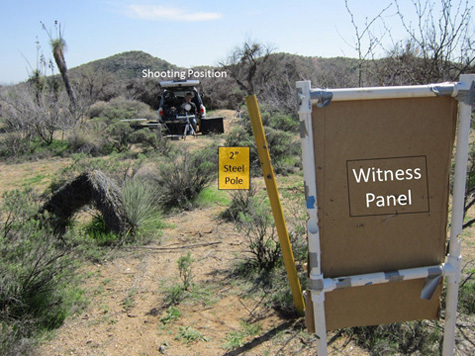 “The authors describe deflection and frequent fragmentation of test-fired bullets that strike an exemplar 2-inch steel mast arm but provide no photographs of any downrange witness panels, the positioning of any such witness panels or any depiction of the integrity or degree of fragmentation of the post-impact bullets. “Table 3 on page 26 of their article lists deflection angles for Shot 3 (the only relevant shot) as “10° vertical and 21° right” but, as before, Holland and DeRonja provide no photographs to illustrate how these numbers were derived. Even if one assumes these numbers are correct and applicable to a 160 grain WCC bullet, the authors have a long way to go to reach a ricochet angle of 39° to 40°. “And so does this now decelerated and destabilized bullet or bullet core. [See Mike Haag’s 3D laser scans.] No post-impact velocity data is provided for this bullet. Deflection angles aside, this information is critical in any attempt to explain James Tague’s superficial injury. 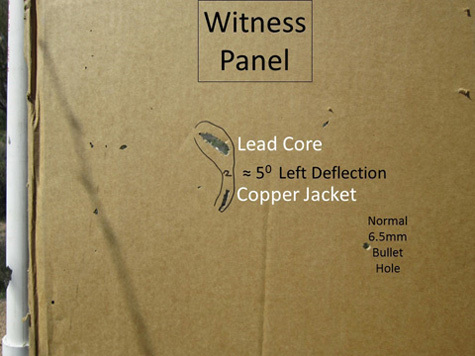 “Their speculative ‘reconstruction’ gets really bizarre when they factor in a disturbance in an area of turf next to a manhole cover as the next impact site for this bullet (core), then on to the strike the concrete curb with a steep upward angle (leaving a lead smear) to produce Tague’s minor facial injury. “This should be laughable to any AFTE member who has studied the ricochet behavior of bullets from yielding and unyielding surfaces, but there it is in figures 21, 22 and 23 on pages 31 and 32 of [DeRonja and Holland’s] May 2016 article. “This writer has to ask again, who peer-reviewed this article? Finally, Holland argued that Haag’s conclusion that the probable fate of Oswald’s first shot was that it struck the asphalt on Elm Street at near muzzle velocity and disintegrated was equally flawed. “Once again, not true,” Haag responded. “[As to the bullet craters], no width or depth measurements were provided in the Spring 2015 AFTE article or Figures 18-21. The craters were not particularly deep; approximately 1-inch. But the most important results were that no recognizable bullet fragments could be found in these impact sites, and from past studies of bullet impacts in asphalt, these impact sites very quickly become unrecognizable as being bullet-caused. “But wait, there’s a little more to Miss Rackley’s recollection which Holland and DeRonja have left out, and it’s important, but certainly of no help to them. But cherry picking of facts and information occurs throughout the Holland and DeRonja articles. “The other unnamed witness referred to in the November 20, 2011 Holland and DeRonja article was likely Royce Skelton who was standing on the triple underpass watching the presidential limousine as it turned onto Elm Street and was now essentially facing [the president’s car]. This witness testified in April 1964 that he saw “smoke” come up off the pavement near the presidential limousine as the shots rang out. “AFTE readers should be suspicious as to why Holland and DeRonja now use ‘witness’ in the singular in their recent May 2016 article. AFTE readers should now go back and look at my Figures 18-21 in the Spring 2015 issue. “While we all should have a healthy skepticism of the accuracy of an eye or ear witness’s recollection, Miss Rackley’s description of ‘sparks’ and a firecracker-like event in the street in front of her are much more in keeping with the appearance of my figures 18-21 than a piece of bullet jacket bouncing off the pavement. Royce Skelton’s recollection even more so. “Frankly,” Haag observes, “I’m surprised that Miss Rackley saw what she has described. Think about it; everyone’s eyes were likely glued on the President and Jackie, not the surface of the street around the presidential limousine. “Once again, Holland and DeRonja display a lack of practical shooting incident reconstruction. To say something did not happen because it was not observed is naïve and foolhardy. “The plume of pulverized asphalt and rock depicted in Figures 18-21 of the Spring 2015 AFTE article only last for approximately one second or less. Only a peculiar odor from this highly energetic event might linger longer. “This brings up another interesting recollection of Virgie Rackley reported to FBI Special Agents Odum and Peggs on the day after the assassination. “She recalled that she smelled gun smoke after the second shot, but did not know where it was coming from. If we can agree that this odor could not truly be gun smoke from the three shots fired from the 6th floor window, what other explanation might there be? Answer: The pulverized rock and asphalt from a high energy, direct shot into the asphalt. “[As to the lack of a visible impact crater on Elm Street], the absence of evidence is not evidence of absence. One needs to know in advance what such sites look like and locate them immediately. Even then, it can be difficult to establish such divots or disturbances in asphalt as bullet-caused. According to Holland, “the first location (expressly identified as occurring at the instant the first shot was fired) was the turf adjacent to a concrete skirt/manhole cover on the south side of Elm Street, about 325 feet west of the traffic signal light. The second location was further downrange: a concrete curb on the south side of Main Street about 24 feet from the triple underpass. “Readers might note or recall,” Haag responded, “that I have never addressed the purported bullet impact site in the turf near a manhole cover, yet it is described above by Mr. Holland as a fact. “My failure to comment on it is for good reason. No matter how much one wants to believe that it is bullet-caused, or actually does believe that it is bullet-caused, there is absolutely no physical evidence to support this belief. “Holland and DeRonja certainly want to believe it as evidenced in their trajectory ‘reconstruction’. But their belief, like so many others, is fatally flawed, and to understand why, one needs to go back to basic Ricochet 101 as taught, as demonstrated many times, and as published by Haag and Haag in their textbook. “Soil, ‘ground’, turf, and grassy locations are all examples of yielding surfaces when it comes to bullet impact and ricochet,” says the man who wrote the textbook. “A number of important and very relevant events transpire when a bullet impacts such surfaces at relatively low incident angles. “If above the critical angle (typically around -10°), the projectile fails to exit (fails to ricochet). If below the critical angle, the projectile interacts with the substrate over distances on the order of several inches to more than a foot before departing. The consequence is a major loss of velocity and a high departure angle, often exceeding that of the incident angle. “So now let’s apply these facts to Holland and DeRonja’s ‘reconstruction’ figure. “This is laughable. One has to ask – where did this ‘bullet’ gain its renewed kinetic energy to produce the extensive damage to this concrete column? Although Mr. Haag has plenty to say about all of this, allow us to clear up one salient point. Holland claims that the strike to the concrete skirt and/or turf surround the sewer cover along the south side of Elm Street was “expressly associated with the first shot.” Holland never says who made the association, however, there can only be one answer – Starvis Ellis, one of the five lead motorcycle officers, who claimed to have seen what he presumed later was a bullet impact along the south curb concurrent with the first shot. Ellis was the left-most (closest to the south Elm curb) motorcycle rider of five riding in formation in front of Chief Curry’s car. The four other lead motorcycle officers were to his right. In other words, Ellis turned to his right, toward the other lead motorcycle officers which means he was facing away from the south curb. “Midway down Elm I remember waving at my wife’s niece and nephew, Bill and Gayle Newman, who had apparently come out to see the President. About the time I started on a curve on Elm, I had turned to my right to give signals to open up the intervals since we were fixing to get on the freeway a short distance away. That’s all I had on my mind. “I thought there had been some people hit back there as people started falling (emphasis added). I thought either some crank had thrown a big ‘Baby John’ firecracker and scared them causing them to jump down or else a fragmentation grenade had hit all those people. In any case, they went down! Actually, I think they threw themselves down in anticipation of another shot. “As soon as I saw that, I turned around and rode up beside the chief’s car and BANG! BANG! two more shots went off: three shots in all! The sounds were all clear and loud and sounded about the same. From where I was, they sounded like they were coming from around where the tall tree was in front of that building. Some observations worth noting: First, Ellis’ recollection were recorded fifteen to thirty-five years after the assassination, long after the influence of outside impressions would have taken root. Second, much of what Ellis says he observed in both interviews doesn’t seem possible given his position in the motorcade, but rather, was more likely gleaned from other accounts and photographs heard and/or seen over the intervening years. For instance, how could Ellis have seen the curb impact after turning to his right (away from the curb) given his physical location? In addition, all of his observations about activities in the presidential car – from 100 to 125 feet away (by his own account) seem remote at best especially given that Chief Curry’s car was between them. Yes, Elm Street is curving behind him, but still it would seem that the distance would preclude much of what Ellis claims to have seen. Further, he mentions the Newmans, but if he actually saw them hit the ground (which occurred after the third shot, and on the north side of the street) then the first shot strike would have to have been much further east at the head of Elm Street, not down near the location of the sewer cover, which was west of the Newmans’ position. 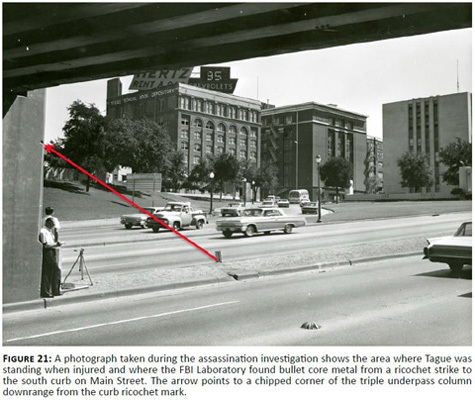 Finally, a photo of Ellis taken by Mel McIntire, (See: Fig 12) shows Ellis (foreground, right) seemingly oblivious (as are his compatriots) of what has happened, well after they left Dealey Plaza. As a matter of fact, Chaney (whom Ellis says notified him of the shooting, and which Ellis told Sneed he was unaware of until Chaney’s notification) can be seen in the same photo (far background, left – in the shadow of the overpass) – not in a position to notify either Chief Curry or Ellis of the shots being fired and the President being hit. In fact, Chaney’s notification of Curry and Ellis is believed to have taken place on the ramp to the Stemmons freeway, shortly after the McIntire image was exposed. 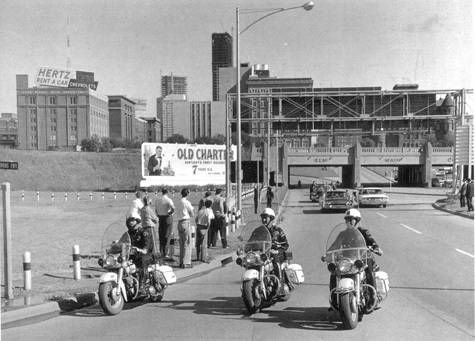 The photo shows the motorcycles about to enter the freeway ramp. Holland is quick to embrace the idea that Ellis is referring to a bullet strike at the sewer cover/turf area near the south curb of Elm Street (what a surprise), yet Ellis’ description doesn’t really say that – he repeatedly mentions the impact being at the curb, the concrete, and the street and only once (with Sneed in 1998) does he add “or grass there.” Ellis died August 10, 2005. Also, worth noting is the fact that Ellis, who rode on to Parkland Hospital with the motorcade, didn’t direct investigators to the sewer cover/turf area as Holland suggests. It was Dallas Police Officer J.W. Foster who was stationed on the Triple Overpass at the time of the shooting, and who wandered to the south Elm Street curb area on his own about ten minutes after the shots looking for where any bullets might have hit. Photos by Jim Murray and William Allen show Foster and Dallas Deputy Sheriff Buddy Walthers investigating the area. Dallas police officers guarded the area and took photos, as Holland points out, however, none of the photographs taken by Murray, Allen, or the police show the bullet mark referred to by Officer Foster; nor was any physical evidence ever found demonstrating conclusively that a bullet had actually struck the concrete skirt, the sewer cover itself, or the adjacent turf as initially believed. Here, once again, Holland cherry-picks eyewitness testimony that is problematic at best to construct a new reality, one in which a preordained vision – his own – is crystal clear. As far as forensics and Tague’s testimony, Mr. Haag found Holland and DeRonja “over-reaching” – once again. “Regarding the ‘bullet strike to the Main Street Curb’,” Haag wrote, “One will find little or no mention of the suspected projectile strike to the concrete curb in any of my five AFTE-JFK articles, and for good reason. “The section of the curb with the defect was not collected until many months later. In the years following the assassination, there have been a number of attacks on the issue of bullet lead analysis. But let’s assume for the moment that it is the result of a portion of a lead core of a WCC 6.5mm Carcano bullet. “Now have a look at the orientation of this presumed lead transfer in Figure LCH-6 to this response and how it fits the Holland and DeRonja reconstruction diagram. A substantially decelerated bullet or lead core from the previous turf strike would be following a descending path at the location of the curb strike, [yet] the deposit on the curb has a decidedly upward track. With regard to Tague’s testimony about the sequence of shots and his injury, Haag wrote: “James Tague was uncertain regarding the timing of his minor facial injury, but he has never claimed that it was associated with the first shot. Mr. LIEBELER. How long after did you feel yourself get hit by anything? Mr. TAGUE. I felt it at the time, but I didn't associate, didn't make any connection, and ignored it. And after this happened, or maybe the second or third shot, I couldn't tell you definitely--I made no connection. I looked around wondering what was going on, and I recall this. We got to talking, and I recall that something had stinged (sic) me, and then the deputy sheriff looked up and said, "You have blood there on your cheek." That is when we walked back down there. Mr. LIEBELER. Do you have any idea which bullet might have made that mark? Many years after the fact, in his 2003 book, Truth Withheld: A Survivor’s Story, Tague recalled hearing three shots – the pop of a firecracker, a short delay, followed by the crack of two rifle shots in rapid succession – just as he testified 39-years earlier. It was during the latter two shots that he felt a sting to his face. In Tague’s mind, it couldn’t be clearer, there was a notable delay between hearing the first shot and being stung on the face during the second and third shot interval. Tague repeated the same sequence of events during NatGeo’s JFK: The Lost Bullet broadcast in 2011. Of course, Tague’s recollections don’t conform to Holland’s first shot mast arm ricochet scenario. Twisting testimony and recollections into a pretzel, Holland tells us only that Tague was uncertain as to which shot caused the sting to his face, but of course, that’s not entirely true. One thing that Tague has always been certain about (and Holland studiously avoids mentioning) is that it wasn’t the first shot. According to expert ballistician Luke Haag then, which shot produced a fragment capable of striking the Main Street curb with only enough energy to leave a lead smear, and go on to potentially be responsible for Tague’s minor cheek injury? “So, that there is no mistake, let’s employ The Scientific Method,” Haag writes in his rebuttal to Holland. “I have repeatedly demonstrated that a shallow, grazing strike to the steel support mast experiences only a few degrees of deflection and cannot come anywhere close to the 40+ degree directional change to go directly to the curb strike [see MGH Figures 1 & 2], or the 36+ degree directional change to go directly to the turf strike near the manhole cover [see MGH-3]. “Moreover, the impact necessary to create these sorts of angular deflections require the bullet to make a deep and destructive contact with the steel support mast which will also result in massive fragmentation and velocity loss of the bullet. 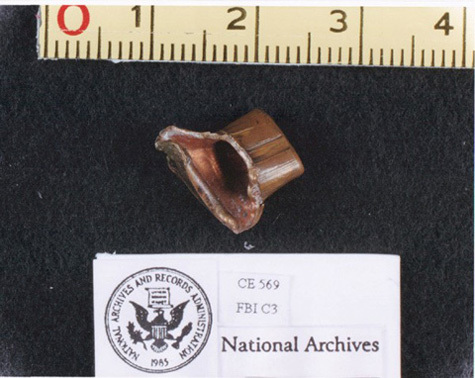 “The bullet which struck President Kennedy in the back and then passed through Governor Connally did not fragment, and became the well-known “pristine” bullet. 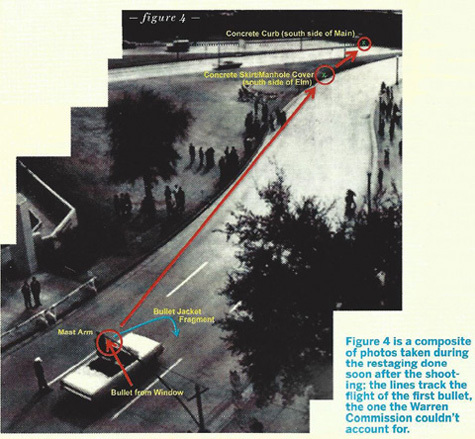 So, Haag makes clear that even if the traffic mast arm was struck by Oswald’s first shot (and remember there is no physical evidence to indicate that it actually was) it could not have been deflected to the sewer cover skirt, or even further to the Main Street curb, as Holland claims. The single-bullet that passed through Kennedy and Connally and was later recovered and certainly could not have been responsible for Tague’s injury. The only remaining possibility is that a fragment from the Kennedy headshot cleared the limousine windshield, struck the Main Street curb (leaving only a smear of lead), and ricocheted to produce Tague’s minor facial injury. This is also what the 1964 Warren Commission suggested had occurred based on a simple process of elimination. No twisted physical laws, cherry-picked testimony, or hocus-pocus necessary. It is becoming increasingly impossible (or perhaps it has already become impossible) for Max Holland to admit that what started as an interesting idea worthy of exploration, and possibly a new theory on which to hang his long-promised book on the assassination, has become a farcical joke as transparent as the Emperor’s new clothes and as phony as Jack’s magic beans. Holland has managed to create a new magic bullet, one as silly and illogical as the one that Dr. Wecht imagined to have hopped, skipped, or jumped out of the presidential limousine to avoid the reality of the single-bullet theory. And let’s not forget that even if Holland’s theory was true, it doesn’t move the assassination story one-inch in any direction – Oswald still has plenty of time to murder Kennedy alone with three shots from his high-powered rifle – whether he had 8.3 seconds (as nearly everyone believes) or 11 seconds (as Holland prefers) to fire two additional shots after his first. Unlike these authors, who have had their fill of Holland-inspired double-talk, forensic scientists like Luke Haag still see dim hope. “Sorry gentlemen,” Haag wrote in summation to his latest rebuttal, “[your first shot ricochet theory] is ballistically absurd. But I will make you this offer. It is an offer Holland shouldn’t refuse. The fate of the missed shot has intrigued many of us for a very long time. The relatively recent involvement of Luke Haag in the debate has, I feel, moved the issue a long way toward a resolution. As far as I'm aware he's the first shooting reconstruction expert to tackle the issue. The various 'bullet deflection' theories never really did convince and to laymen such as I, a direct strike into the road always seemed unlikely. However, Haag's detailed work makes a very persuasive case for such an event. His assertion that, “The rapid degeneration and loss of ‘fresh’ bullet impact characteristics in asphalt are well-known to AFTE members trained and experienced in shooting scene reconstruction." is something that I didn't know. Bearing in mind that an entire procession of cars and buses all drove over the area of the postulated strike site immediately after it was made adds to the idea that any signs of freshness might have been obliterated within minutes. Max's treatment of the eyewitnesses is disappointing. Whether one accepts their observations as being accurate or not, they must be entered in the equation. The omission and misrepresentation of such witnesses isn't new or unique to Max, of course. I have just finished reading 'Phantom Shot' by Majerus and Nessan (CreateSpace Independent Publishing Platform; 1 edition (11 Oct. 2013)). In it, they argue for only two shots during the assassination. One of the main methods employed to make the only-two-shots case, is the avoidance of eyewitnesses. Mrs Donald Baker (nee Vergie Rachley), Royce Skelton and Mr & Mrs Franzen all reported seeing and hearing something hit the road which caused dust and/or sparks to fly up; yet none of these people appear in the book! Postal inspector Holmes is featured in the book but his description of 'dust' flying into the air is omitted. Many thanks for presenting the continuing debate on the subject. I very much hope that Max will take-up Luke's generous offer.